Ice River - ZineWiki - the history and culture of zines, independent media and the small press. 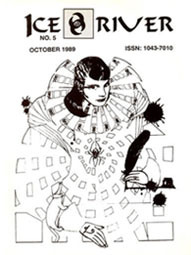 Ice River was a literary science fiction and fantasy zine edited by David Memmott and published by Wordcraft in Oregon, U.S.A.
Ice River ran at least seven issues from Summer 1987 to 1990. David Mammott writes in the 2010 issue of Phantom Drift, "...in the summer of 1987, Ice River Magazine... was launched to explore, for lack of a better description, a literature of the fantastic. A literature of curious cross-fertilizations. A literature of intersections between literary writing and fantastic themes. A literature of satirical and techo-altered landscapes. Literary science fiction. Modern fantasy. Magic realism. Surrealism. And fabulist tales of inner worlds outside of time." Cover artwork was by Bucky Montgomery (#6). among others. Poetry was contributed by Ivan Arguelles, Rane Arroyo, John M. Bennett, Bruce Boston, Mel Buffington, E.G. Burrows, David Castleman, Kurt Cline, S.R. Compton, Jack Dann, Andrew Darlington (Ludd's Mill), Denise Dumars, Christopher Dungey, Robert Frazier (Speculative Poetry Review, Star*Line), Loss Pequeno Glazier, John Grey, Genine Hanns, Archibald Henderson, Greg Heym, Andrew Joron (Velocities), Lee Crawley Kirk, Richard Kostelanetz, Lisa Kucharski, Richard Laubly, Ursula K. Le Guin, Lyn Lifshin, Elissa Malcohn (Star*Line), Paul Merchant, Tom Micklem, Edward Mycue, B.Z. Niddich, Joyce Nower, Susan Palwick, Anselm Parlatore, Georgette Perry, Kathryn Rantala, Dan Raphael, Mark Rich (The Silent Planet, Treaders of Starlight), Lorraine Schein, Ann K. Schwader, Glenn Sheldon, Steve Smith, Richard Taylor, William J. Vernon, Tom Whalen, William Winfield, t. Winter-Damon, Christine Zawakiwsky, and others. Fiction came from Lee Ballentine, Conger Beasley, Jr., Bruce Boston, Calvin C. Clawson, Scott Edelman, Carol Emshwiller, Richard Gessner, Chris Hagelstein, Frederick Hohing, Marc Laidlaw, Stanley Nelson, Leland Neville, Misha Nogha, Lance Olson, Richard Paul Schmonsees, Lucius Shepard, Richard Singer, Brian M. Stapleford, Don Webb, Tom Whalen, Thomas Wiloch, and others. Regular columns included "Points of Impact" by Misha Nogha. Articles and reviews were by W. Ritchis Benedict, Michael Chocholak, Richard Lostelanetz, Noemie Maxwell, Marge B. Simon (Star*Line), Don Webb, and Neal Wilgus, among others. This page was last modified on 16 September 2012, at 04:00.